Could the third time be the charm for The Legend of Hercules? The first of two competing films in 2014 to focus on the Greek divine hero has received yet another trailer a month ahead of its opening day, following in the wake of a clip released two weeks ago and the teaser unveiled for October's New York Comic Con (back when the film was titled Hercules: The Legend Begins). By now, one might hope that a new promo would offer more reason to get excited, but this two-minute clip is just a lot more of the same. That might not necessarily be a bad thing; maybe there's a lot more footage to be seen that just hasn't been used in marketing yet. That said, the sheer uniformity of each of these clips, and the pace at which they're being released, doesn't speak very well to what director Renny Harlin has cooked up here. That is, of course, to say nothing of the content that's actually on display in all three bits, or the fact that The Legend of Hercules ultimately looks like a mashup of every sword-and-sandal production to hit theaters and premium TV channels in the last six years. 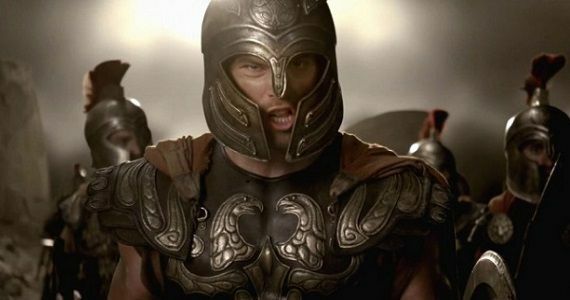 Speaking to narrative, the film reads like a fairly straightforward origin story: born of the god Zeus, but with no knowledge of his heritage, Hercules (Twilight's Kellan Lutz) must choose his destiny and decide between either running off with his true love, Princess Hebe (Gaia Weiss), or assuming the mantle of hero and overthrowing the tyrannical King Amphitryon (Scott Adkins). In between all of that, Hercules dukes it out in gladiatorial pits (a'la Spartacus and Ridley Scott's Gladiator), all in glorious speed-ramping fashion (a'la Zack Snyder's 300). At a glance, there doesn't look to be a creative, inventive bone in The Legend of Hercules' body. It's impossible to judge a film based on a trailer, though, so no matter how derivative and uninspired Harlin's efforts may appear, there's always a chance that he's cobbled together some worthy action schlock. It could be that the film ends up playing like Olympus Has Fallen, Millennium Films' surprisingly effective action effort from earlier this year. But little in the trailer suggests that The Legend of Hercules shares the same kind of tone and attitude as that movie, so maybe what we see is really what we're going to get. Placed against both Dwayne "The Rock" Johnson's Hercules: The Thracian Wars and 300: Rise of an Empire, this looks like it's going to be fighting an uphill battle all year long. We'll see if it has what it takes come January. The Legend of Hercules arrives in US theaters January 10th, 2014.